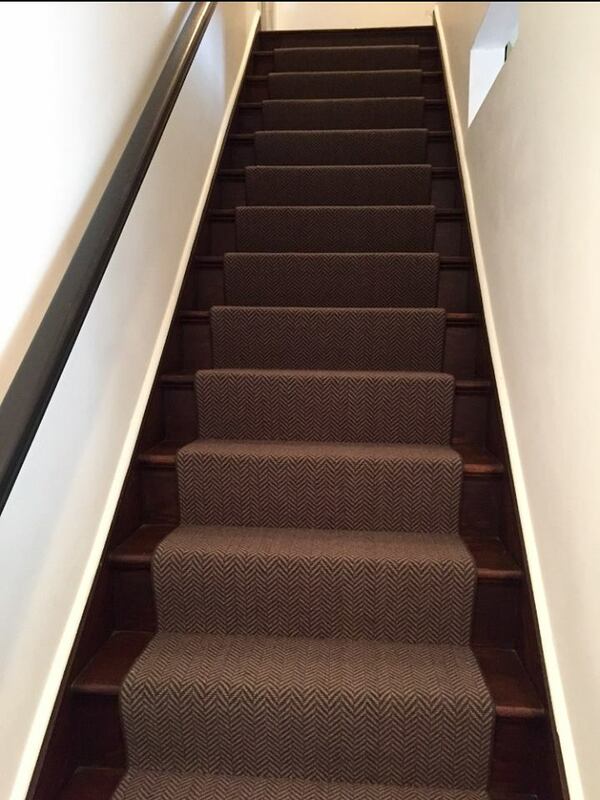 Last week, we posted a few photos on our Facebook page of a stair runner we just installed. As you can see above, the project came out fantastic! The patterning not only looks stunning against the dark wood floors; the runner provides some protection for the stairs themselves and greater safety for everyone. Just like paint, carpet looks different in the store than it does at home. Your furnishings may make it look much darker or lighter than you anticipated, and maybe you didn’t realize the pattern would clash with the curtains you so love. The solution is simple: SAMPLES! Bring home tons to try against your furniture and adjacent flooring, and don’t be afraid to go a little wild with your selections. Sometimes, the pattern or color you never imagined would look right is the one that pops as the obvious choice! Stair runners take a beating day in and day out. As a result, it doesn’t pay to choose carpeting that’s cheaply made; within a year or two, it will probably look like it needs to be replaced. If you want to cut costs (and who wouldn’t?! ), it’s best to choose a high-quality brand that’s been discounted thanks to closeouts, overstocks, or overruns. This way, you know you’re getting a product that will still look great years down the road. Where can you find luxury brands at discount prices? Norman Carpet One, of course. Remember to take the daily goings-on of home into account when choosing a stair runner. For example, if you tend to have lots of muddy feet (or paws) running up and down the stairs, it’s probably best to choose a darker color in a stain-resistant material. Materials such as sisal, too, look fantastic but can be too slippery than some would prefer, particularly those carrying young children up and down the stairs. Consult with carpeting experts on the kinds of carpeting that would best suit your household. In many homes, the front stairs are the first thing you see when you walk in the door. All the more reason to choose wisely when selecting your stair runner. The right color, patterning, material — and proper installation — can make all the difference! Come see what we have to offer at our stores in Conshohocken and Bryn Mawr! We’d love to help make your home or workplace safer, more comfortable, and more beautiful.